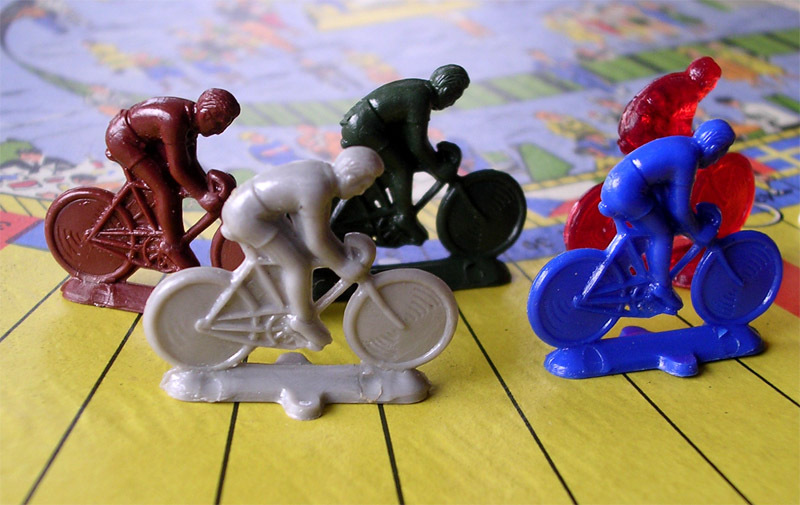 This simple track cycling game seems to have enjoyed some success, if we measure it by the many different editions. There are a couple of different German versions, a Dutch/French version (maybe it is a Belgian release? 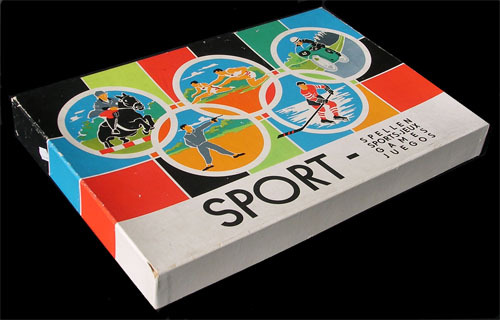 ), and it has also been included in a sports game compilation box called "Sport-" in the Netherlands (?) 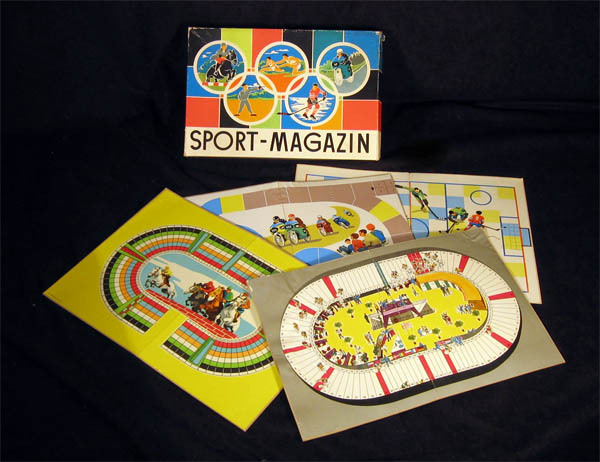 and "Sport-Magazin" in the DDR. (Of course, those are just the editions I have seen. There may be more). 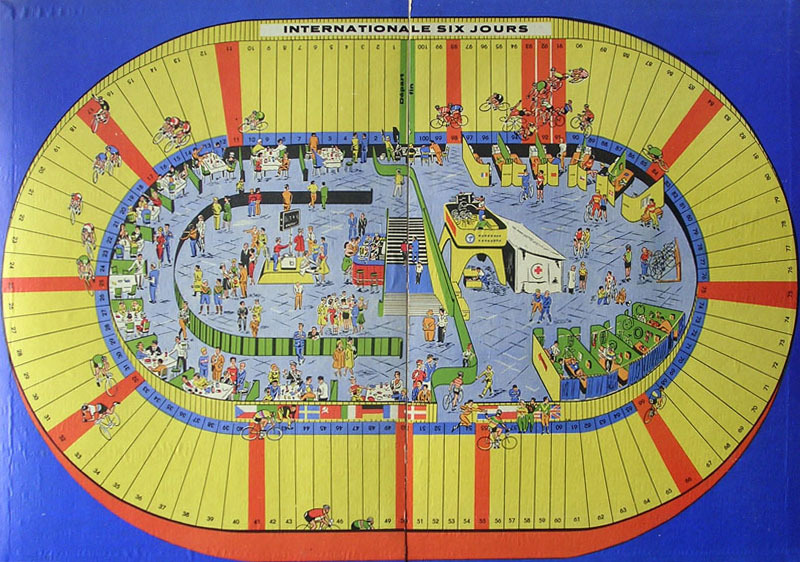 Both the 1959 german edition, by VEB (K) Kartonagen und Bürobedarf and the "belgian" edition feature the blue board (in the german edition it says "INTERNATIONALES BAHN-OMNIUM" instead of "INTERNATIONALE SIX JOURS"). The 1964 German edition is by SPIKA. It features the Spika logo on the cover (the box is slightly smaller too) and the grey board. Both compilation boxes have the grey board. Another difference is in the rules. 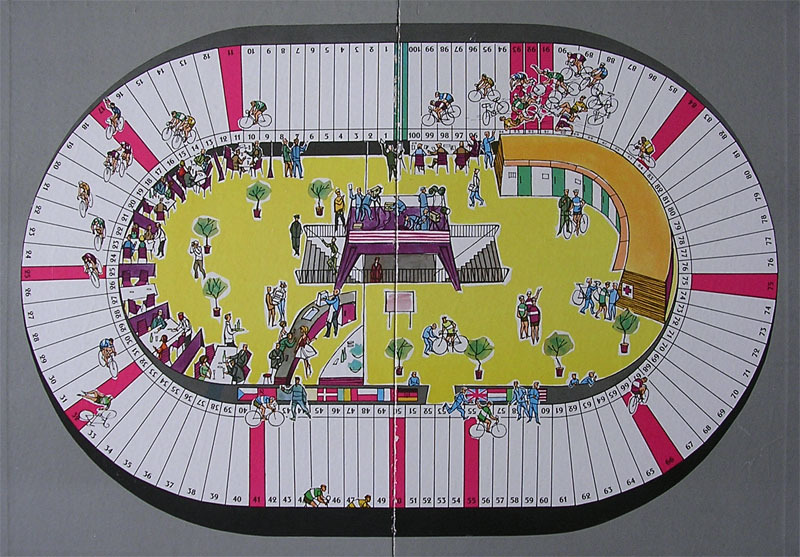 The first german edition has rules for 5 different races. The "Belgian" edition has the rules for the same 5 races, but in telegraphic style. The second german edition and the compilation boxes only have the rules for three races (we lose the "pursuit for two players" -which is not the same as the "pursuit for two racers", which is still there- and the "points over 4 races"). 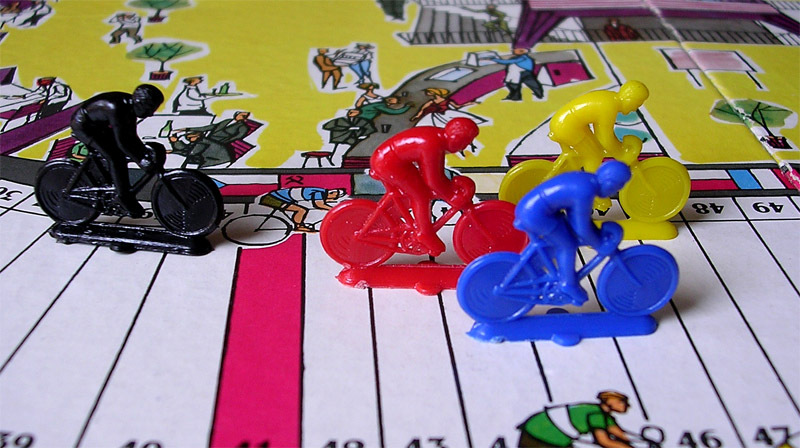 By the way, the only non-trivial game is the team pursuit, in which each player manages a team of two riders. Each team starts on opposite sides of the track. On his turn, a player throws one die and decides which of his riders he advances. The winner is the player whose first rider catches his opponent's second rider. My question is: which is the correct strategy? Send me your answers. (Yes, the correct strategy is to throw more sixes than your opponent, but I do not accept this answer). 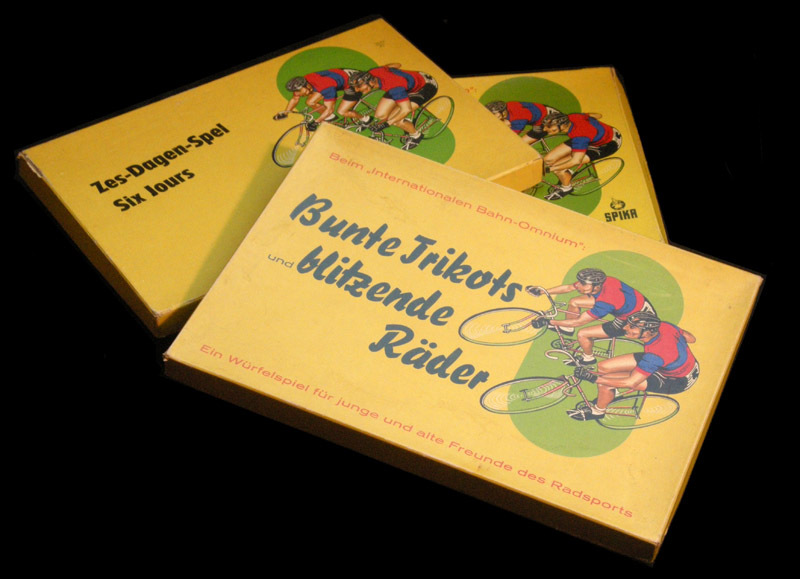 The little "wings" on the cyclists' base appear in all the German editions (at least in the copies I have, including the compilation boxes) but not in all the Belgian editions. The compilation boxes include seven other sports: Ice Hockey, Football, Horse Racing, Motorcycle Racing, Car Racing, Airplane Racing(! ), and Pentathlon. Thanks to Rudolf Rühle for his comments and his expertise on DDR games. Thanks to Benny Bosmans for sharing his experience with this game and for pointing minor mistakes about the riders' base.